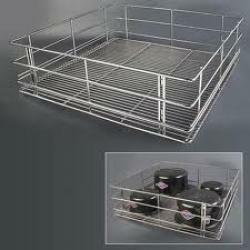 We are a leading Manufacturer of regular basket in pune from Pune, India. Catering to the needs of modular kitchen, we are involved in manufacturing and supplying a commendable gamut of Regular Basket. We are backed by highly diligent professionals who manufacture this product as per the exact requirements of our clients. Our professionals used high-grade stainless steel to manufacture this product so as to make it reliable for its applications in homes, canteens, restaurants and hotels.